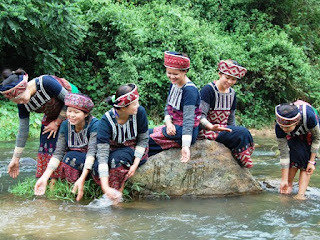 History: The Xa Pho came to Vietnam about 200 – 300 years ago. Some believe that their clothes indicate they immigrated from the southern islands of Asia, such as Malaysia and Indonesia. 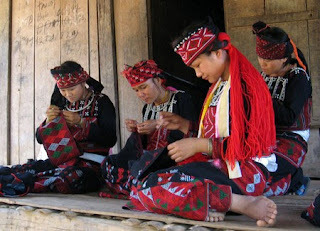 Language: Their language belongs to Tibeto – Burmese language group. 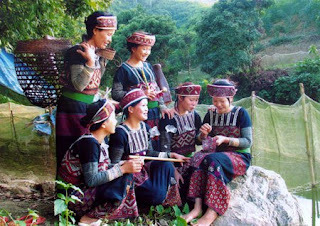 Other minorities say that Xa Pho people can speak most of the other languages in the area, but it is “difficult to hear their language which sounds like birds singing”. Costume: The Xa Pho’s clothes are very different from other minorities. Women wear a short shirt with a long skirt made from indigo-dyed hemp fabric. They use a bright red thread to embroider decorations all over their clothes. 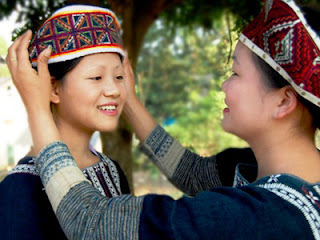 Social organasation: The Xa Pho community is particularly strong and neighbours play an important role in their villages. If a family has no food, they can visit their neighbours for every meal. If both families have no food, they will go to another family together. When no one in the village has any food, they all go to find fruit and vegetables in the forest. When a family kills a chicken or a pig, everyone in the village can come to have some without an invitation. Birth: After a women gives birth, strangers are prevented from coming into the house. The family either hang a hat on a pillar in front of their house, or use a blackened pilllar with leafy branches attached called dum dum to warn people away. A name-giving ceremony is carried out 12 days later. Each person has two names – one is used in a normal situation, and other when worshiping the ancestors and being worshipped after death. Marriage: Young Xa Pho have the right to have sexual relationships before marriage. The Xa Pho has a very low population, so the man wants to make sure his partner can have children. The marriage will be organised after the young couple know the woman is pregnant. The future bride starts making her wedding dress while her groom prepares pigs, chicken and other food for the wedding. Funerals: The deceased is placed in the middle of the house, with the head in the direction of the household altar. Water used to wash the deceased’s face is left to evaporate. There must be a bowl of rice with a pair of chopsticks and a barbecued or roasted chicken next to the alter. The deceased’s children put straw around the wooden coffin, as they used to use straw as mattresses. The coffin is buried in a grave or a tomb. Lots of people must attend the funeral to ensure that the spirit of the dead doesn’t stay at the tomb or cemetery. Housing: The Xa Pho live in houses built half on stilts and half on the ground. Furniture is very simple and made of bamboo or rattan. Artistic activities: The Xa Pho dance for many occasions – marriage, funerals, births, even when they have run out of food. Their dancing style is very different to other minorities. Accompanied by a drum beat, they join hands and dance in a circle around a fire.